A dental crown is an excellent solution for many tooth problems and can provide good, long-lasting results. Dental crowns are recommended to repair a broken or cracked tooth, strengthen and protect a damaged tooth, to stabilize a tooth, or to reinforce a tooth after a root canal. Dental crowns can restore full functionality to a tooth, protect it from further decay, and improve your smile! At North Boulder Dental we use high-quality porcelain crowns that are made to match your other teeth and provide outstanding results. Let’s explore a few things you should know before getting a dental crown. Your dentist wants you to be comfortable with your oral health choices and to understand the options available to you. Talk to your dentist about exactly why a dental crown is the best solution and why the tooth needs repair. Is the tooth completely cracked? Are you experiencing decay? What are the other options? Being a proactive and involved patient is always the best course for any treatment! High-quality, porcelain dental crowns are highly durable and should last up to 15 years. In some cases, crowns can last up to 25 years! Dental crowns require good oral health maintenance habits including regular brushing, flossing, dental checkups, and cleanings. Talk to your dentist about their experience and what situations might cause a dental crown to need replacing. 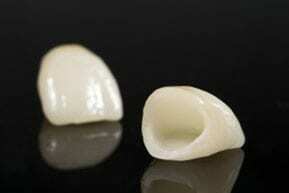 What is the process to get a dental crown? In the past, getting a dental crown was a big deal that took several visits to the dentist office. Today, it is more straightforward! At North Boulder Dental, we work with patients to place dental crowns in two trips. The first appointment prepares the tooth, makes an impression for the crown to be made, and puts in a temporary crown. An appointment is then made about two weeks later to place the crown and cement it in place. Will the crown look like your other teeth? Dental crowns are made from a mold of the tooth and color matched to your other teeth. You should expect your dental crown to be unnoticeable next to your other teeth! Porcelain dental crowns are durable, stain resistant, and can be made in any shade to match your other teeth. Does it hurt to have a dental crown? Talk to your dentist about any concerns you have but, no, it should not be painful or uncomfortable to get a dental crown. A local anesthetic is used to numb the area surrounding the tooth. The process is relatively quick and a well-made, properly fitted crown should cause no discomfort after placement. What care does a crown need? Dental crowns provide robust, durable protection for a broken, eroded, decayed or otherwise damaged tooth. Like other teeth, you should plan on regular brushing and flossing all of your teeth, including the crown, to keep it at its best. Avoid or break poor oral hygiene habits like chewing on ice, biting your fingernails or opening packages with your teeth! If you clench your teeth at night, talk to your dentist about mouth guard options to protect your teeth. If you are considering a dental crown or in need of a checkup, contact us! We have been helping Boulder achieve and maintain beautiful smiles for more than 30 years!